This week we're kicking off our photo journey in the house, and are taking a look at a couple of house plants. The first one is a Guzmania (Bromeliaceae) which comes from the family of Bromeliads that also include the Pineapple. 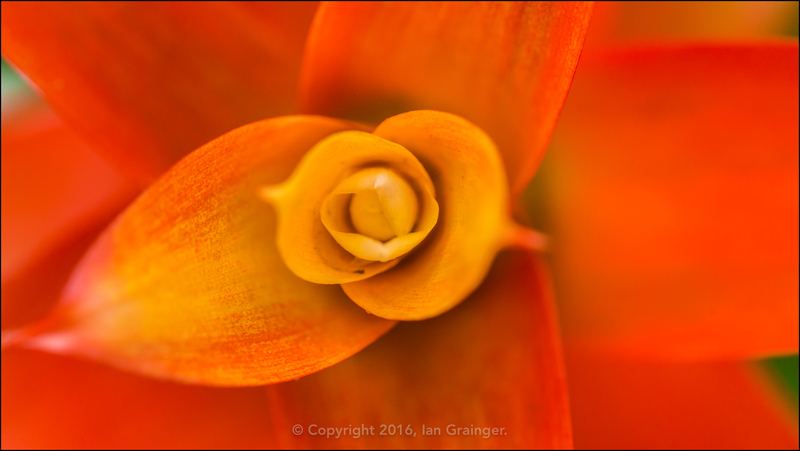 This particular plant is a lot more colourful than a pineapple though, sporting orange bracts atop lush green foliage. 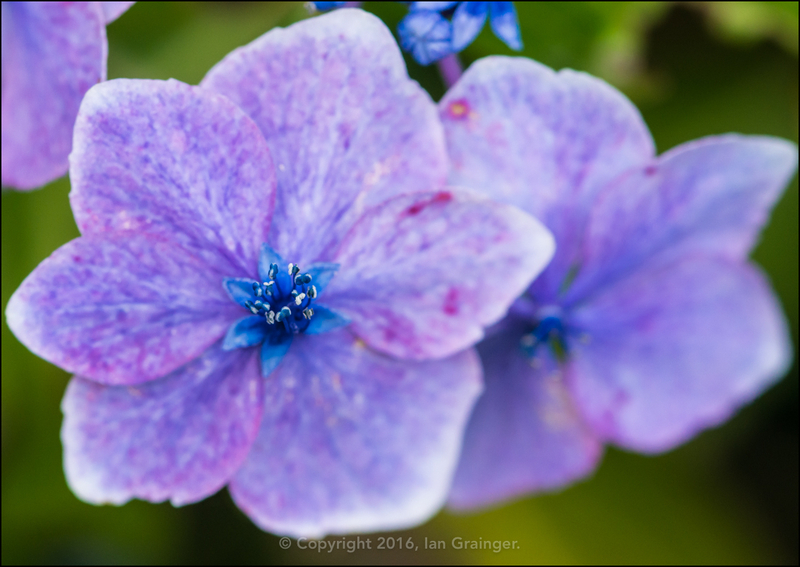 The second house plant is an old favourite of my Image of the Week posts, and was first seen in an October 2015 post, although I first photographed the plant at Christmas in 2014! 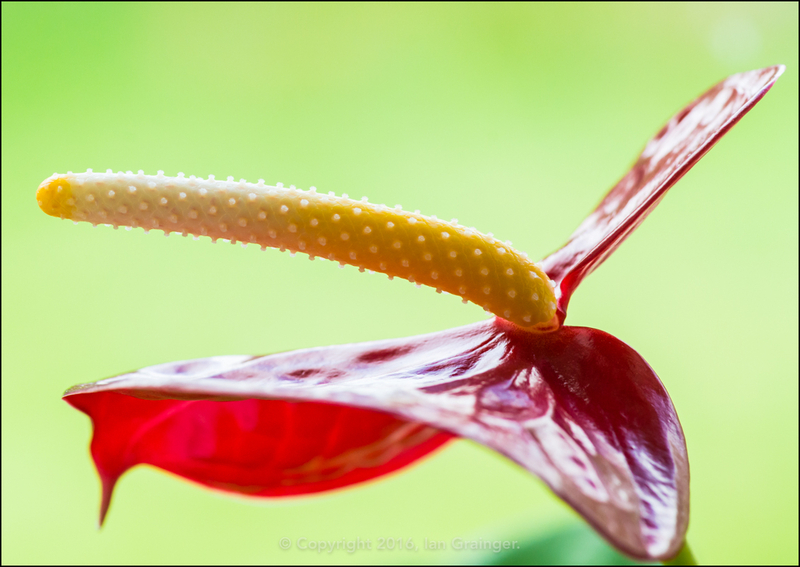 It's called an Anthurium, although is probably better known as a Flamingo Flower. When I eventually ventured outside at the weekend it was quite a beautiful day, with blue skies overhead. 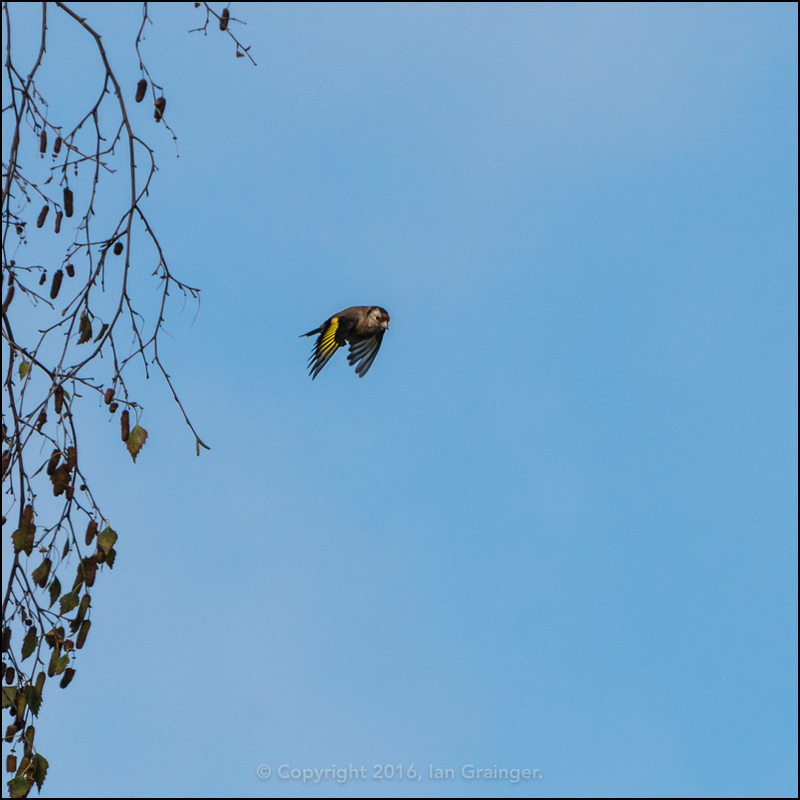 So, what better to do than point my camera skywards and start shooting my feathered friends? 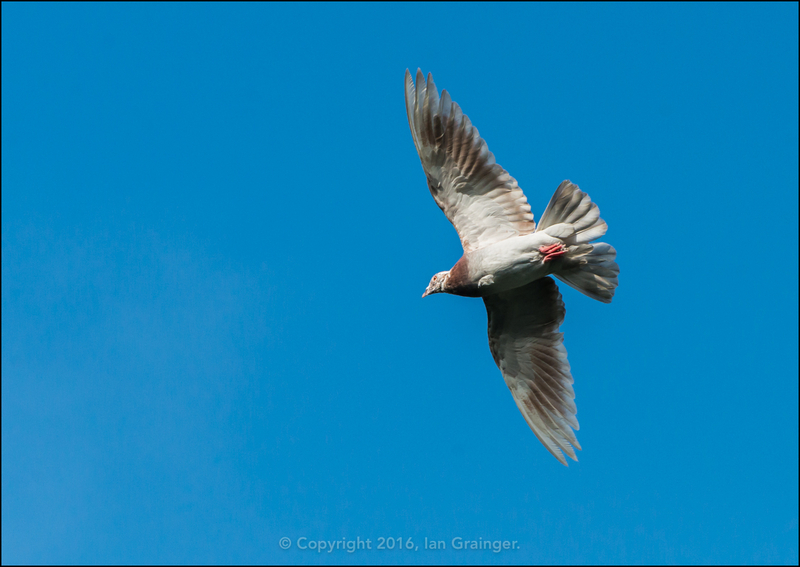 This Feral Pigeon (Columba livia) was conveniently passing over, so was my first catch of the day! 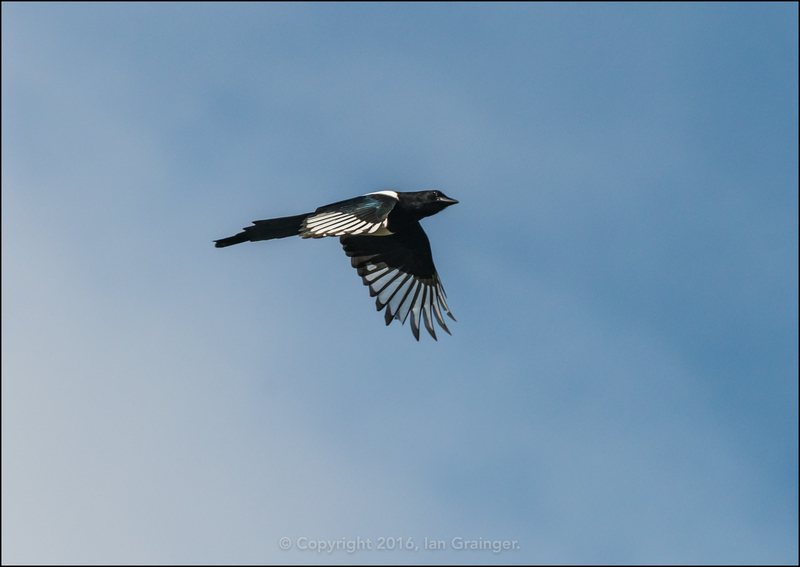 This was closely followed by a Magpie (Pica pica) passing close by. 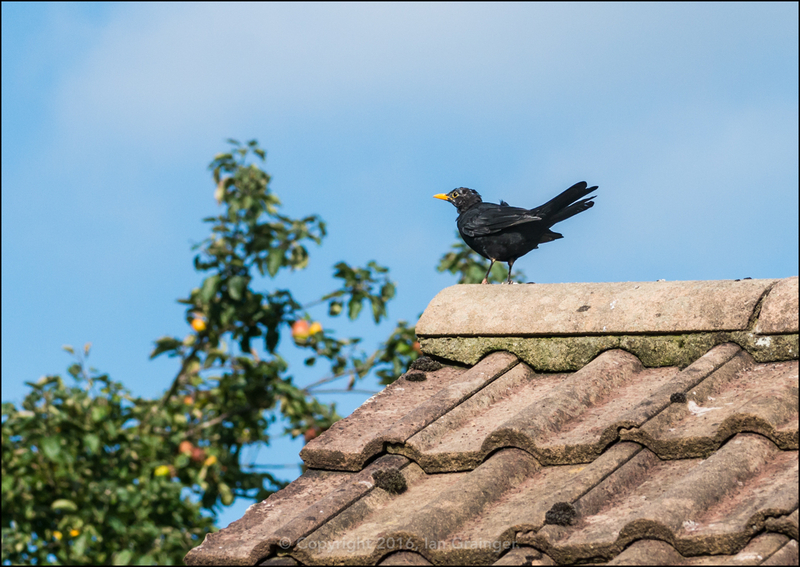 I was intrigued to see this bald looking Blackbird (Turdus merula), and I think he was eyeing up the tasty looking apples growing on the tree in the background. 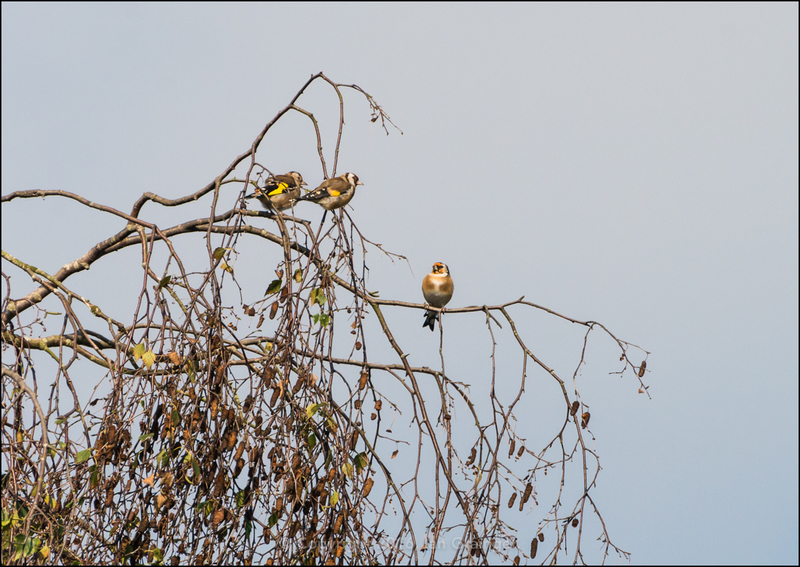 My attention was then drawn to a family of Goldfinches (Carduelis carduelis) that were busy making lots of noise as they flew overhead. 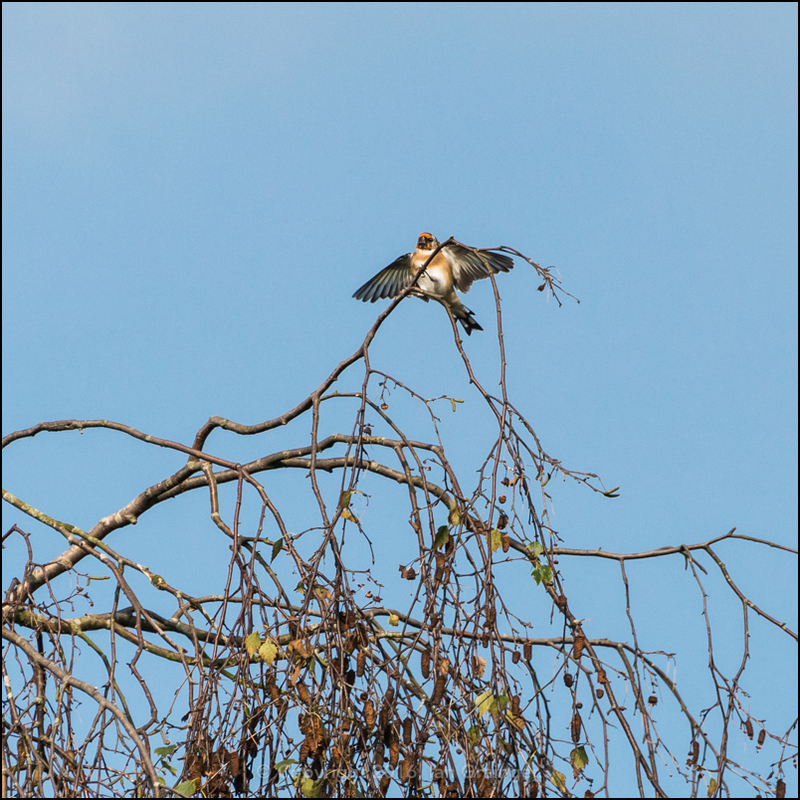 This one was the first to land on a favourite perch as discussed last week. 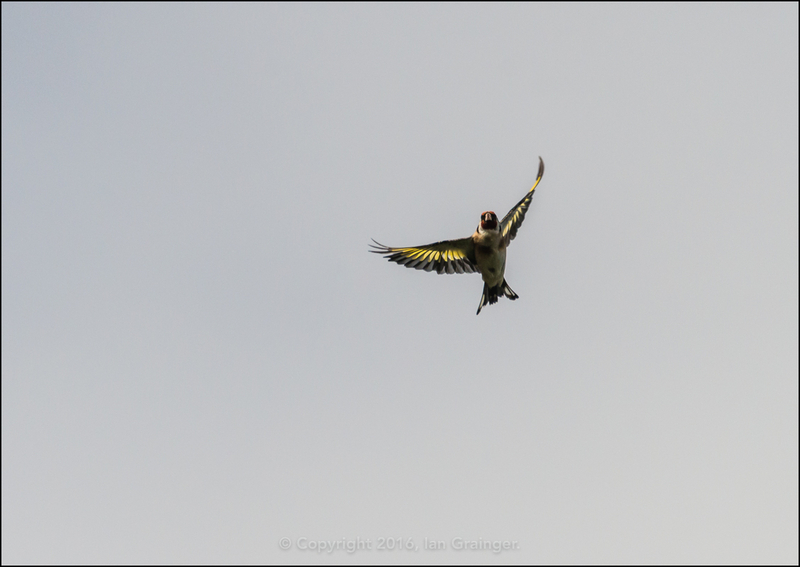 It was closely followed by a few other family members, including a couple of juveniles. ...just before the apparent leader of the gang headed off! 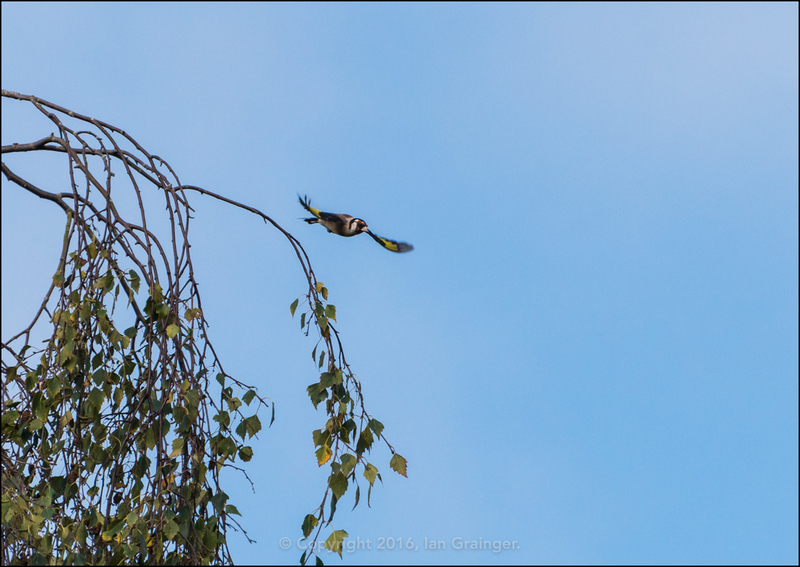 One of the juveniles then quickly followed what I assume to be a parent bird. 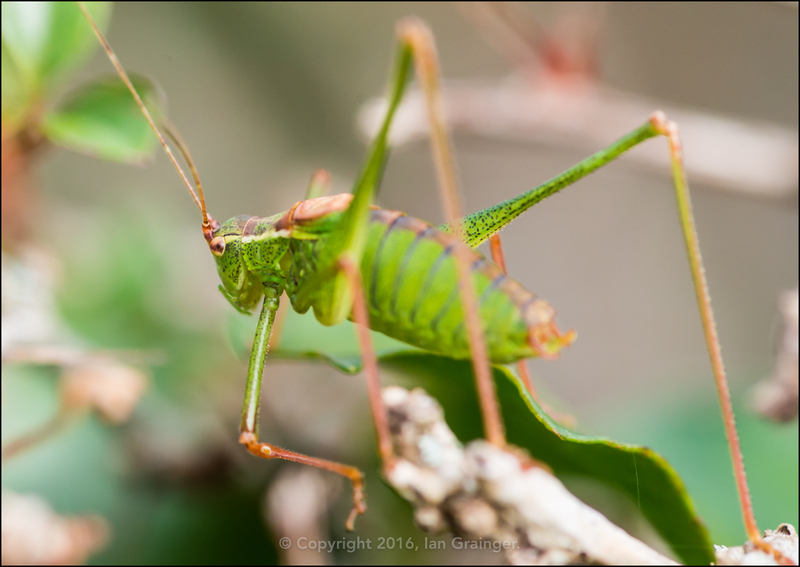 Back on terra firma, I spied a Speckled Bush Cricket (Leptophyes punctatissima) skulking around in a bush. 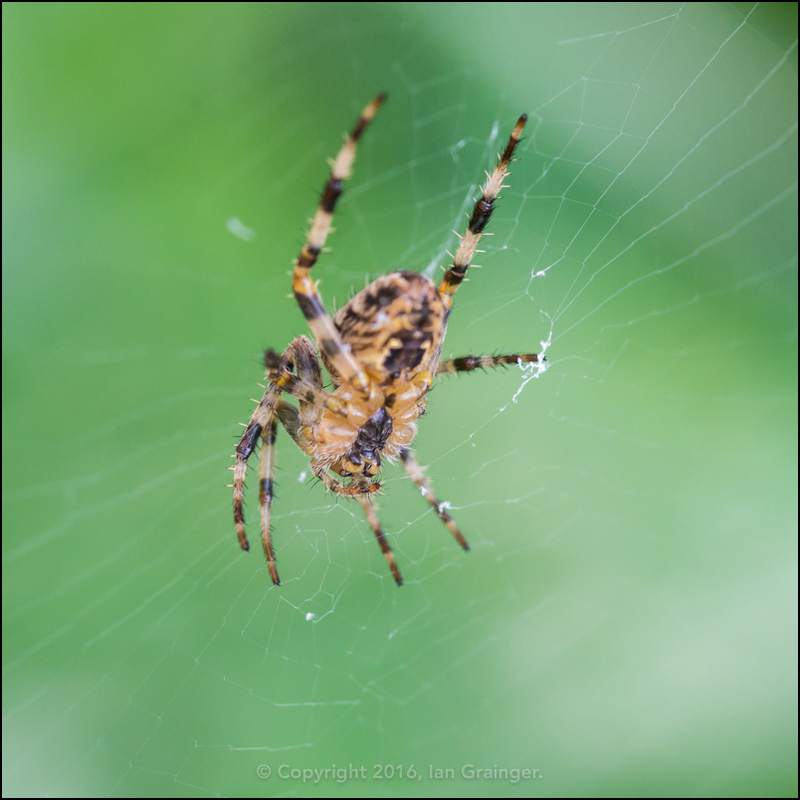 While the Garden Spiders (Araneus diadematus) were out in force, building their webs anywhere and everywhere. 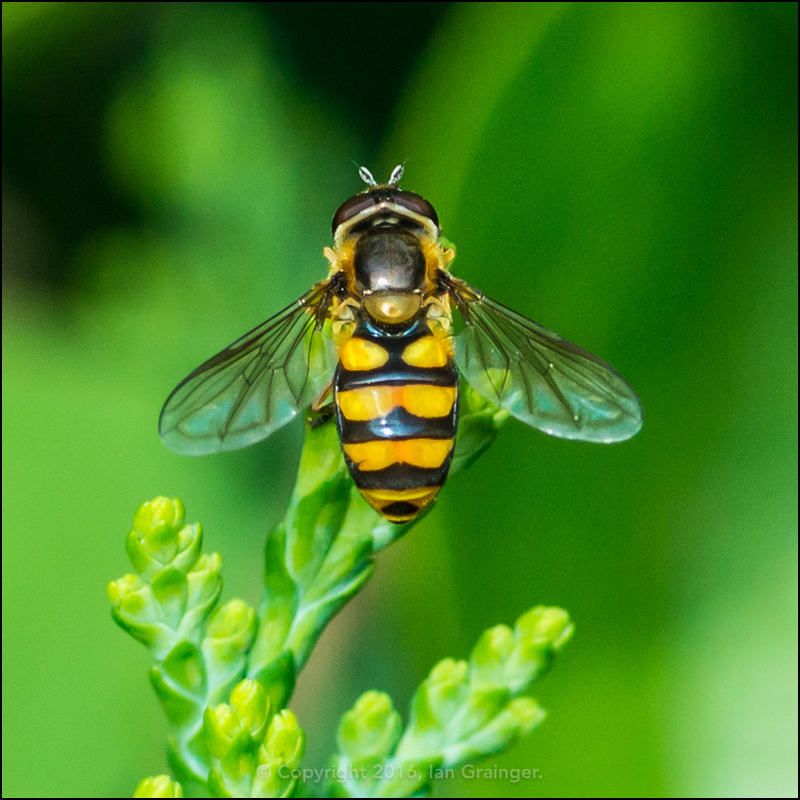 This Hoverfly was enjoying the sunshine, and sunbathing within a conifer tree. 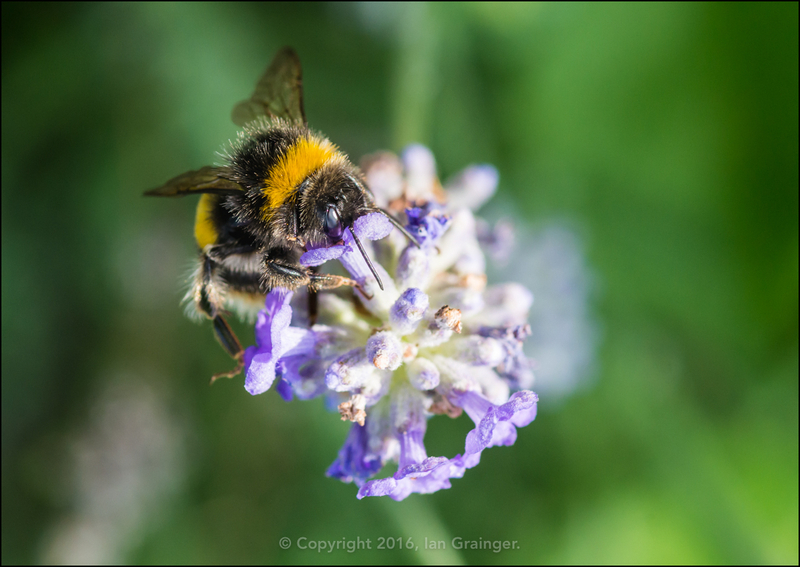 The Bumblebees (Bombus) were still finding plenty of late summer pollen to collect, although there were definitely fewer blooms to collect from than last week. 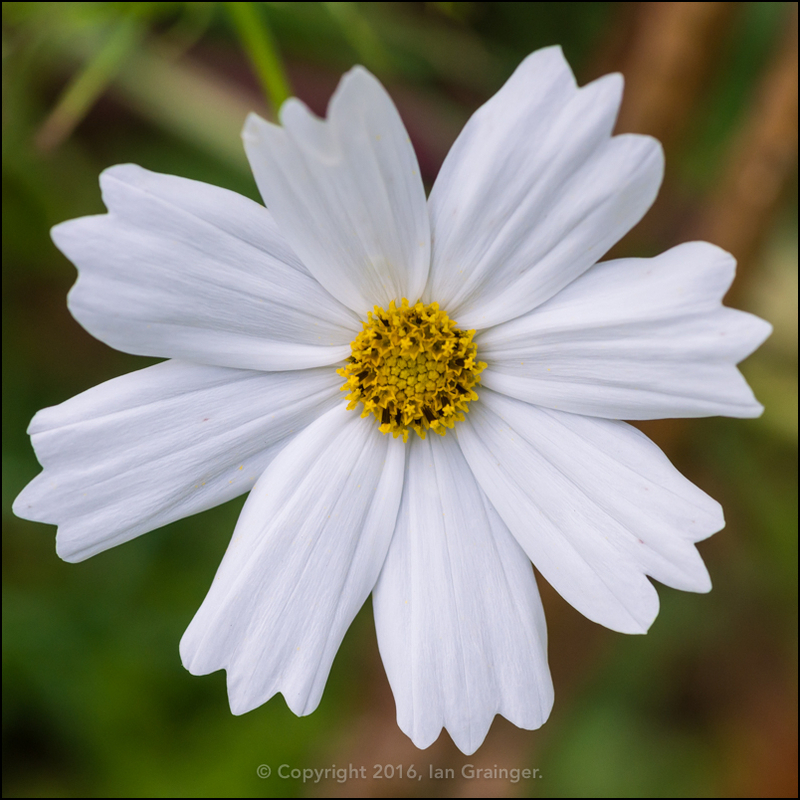 The Cosmos (Cosmea) were finally coming to an end in dad's garden, and this white one looked like it would be the final bloom to show. 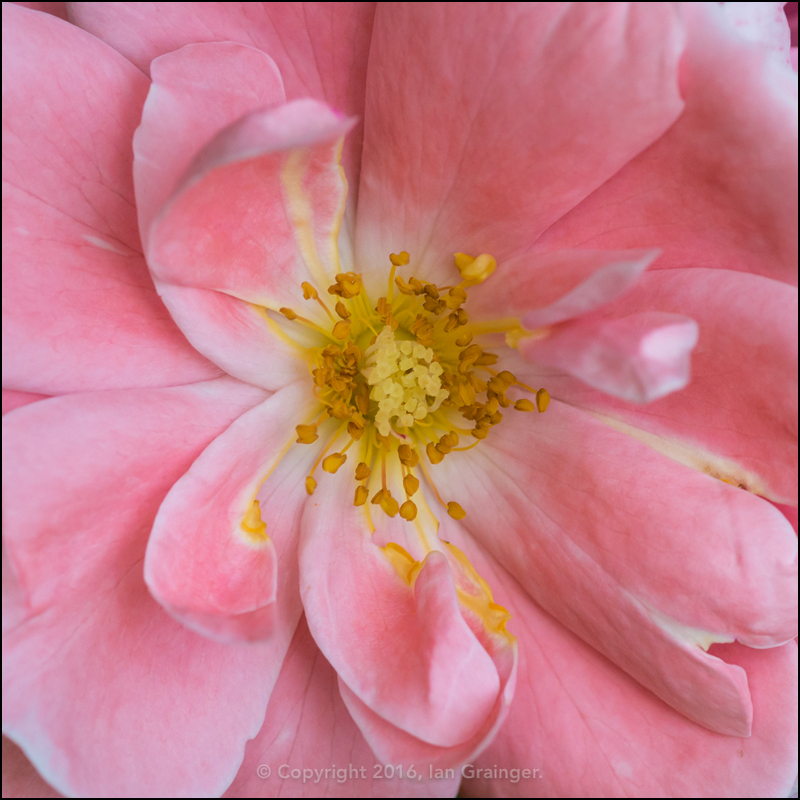 At least the Queen Elizabeth Rose (Rosa) had flowered again, bolstering the number of flowers in the garden. 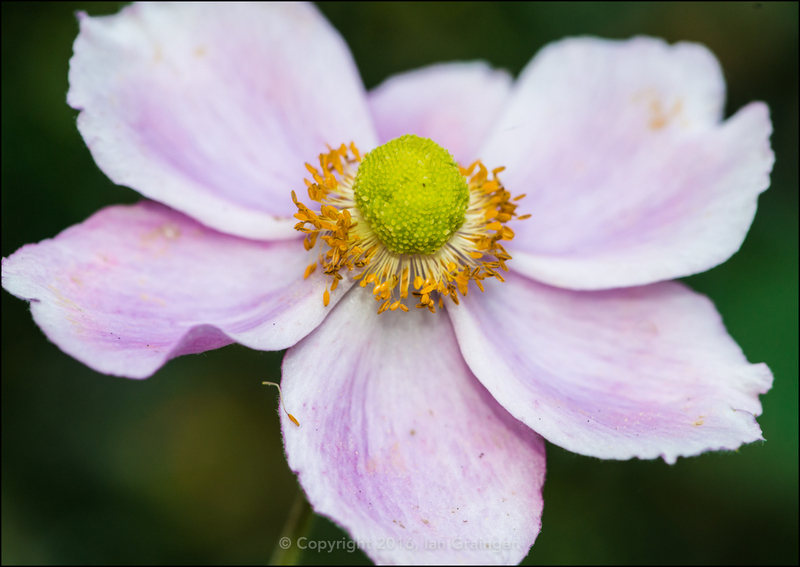 The Japanese Anemones (Anemone hupehensis) were still going strong, and would hopefully continue to flower all the way into October. 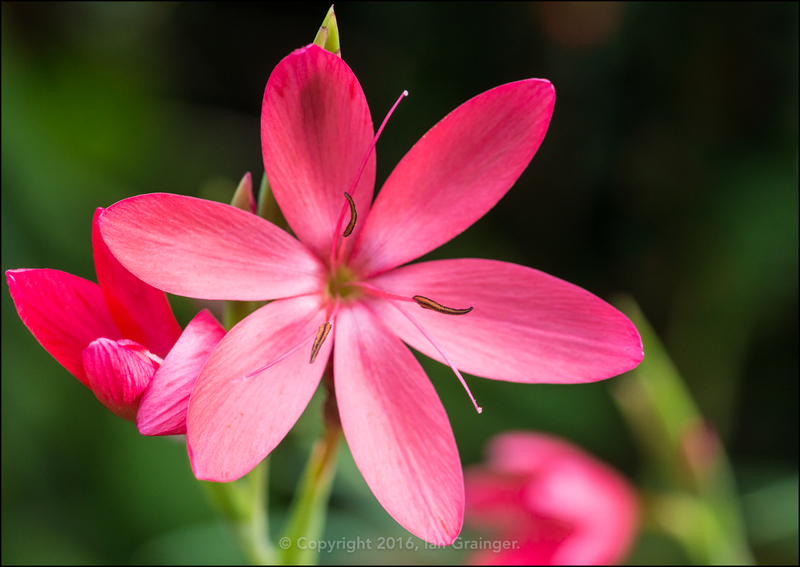 Along with the Japanese Anemones, the River Lilies (Hesperantha coccinea) were still putting on a nice display, and again would hopefully keep going well into October. 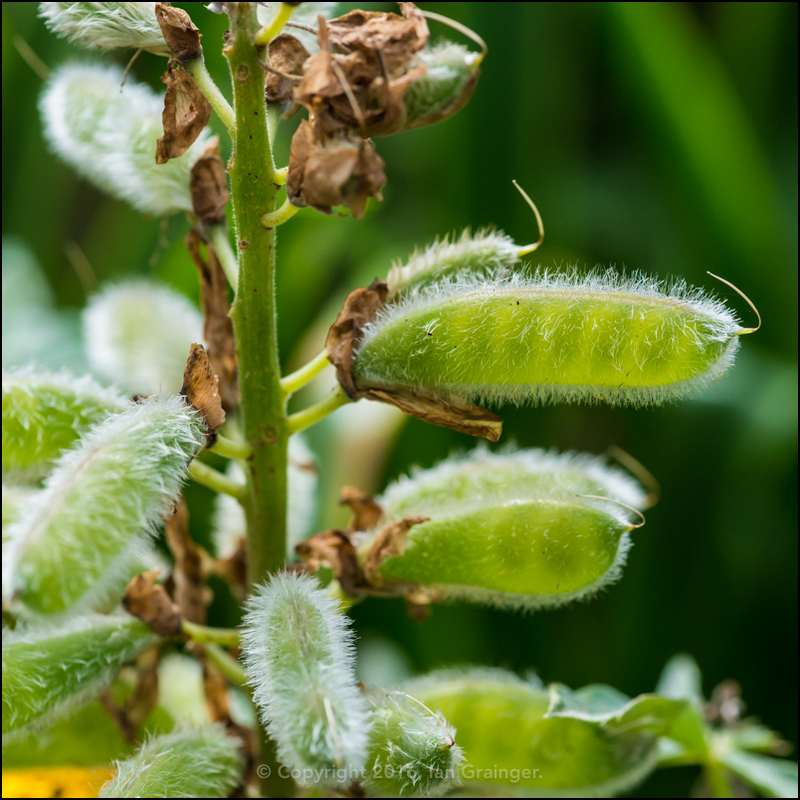 ...while this one had broken out into new bracts and flowers. 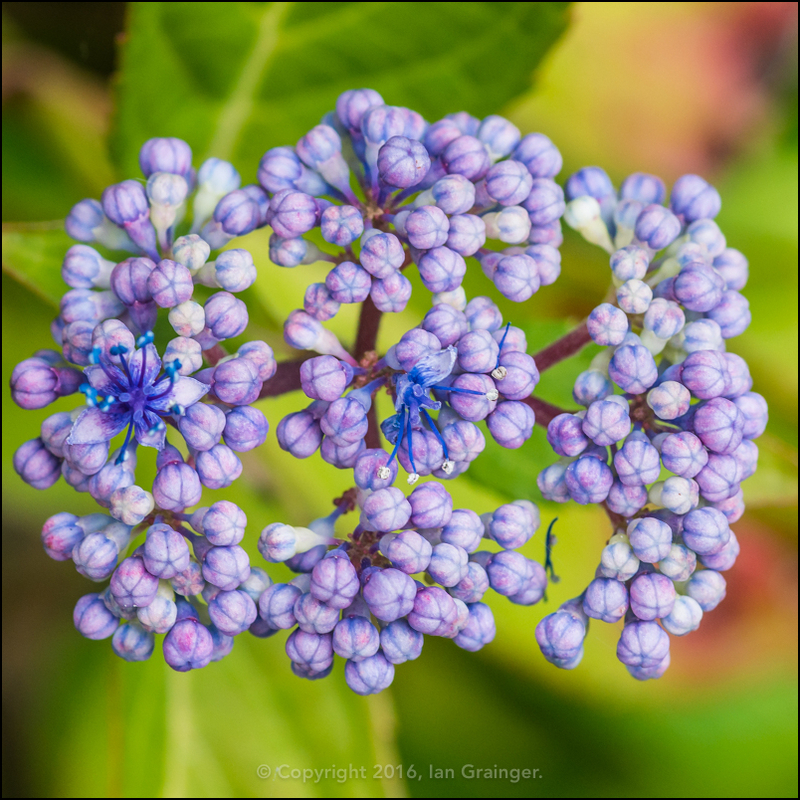 Over in my garden, I didn't have any new flowers, but I did have old ones returning. 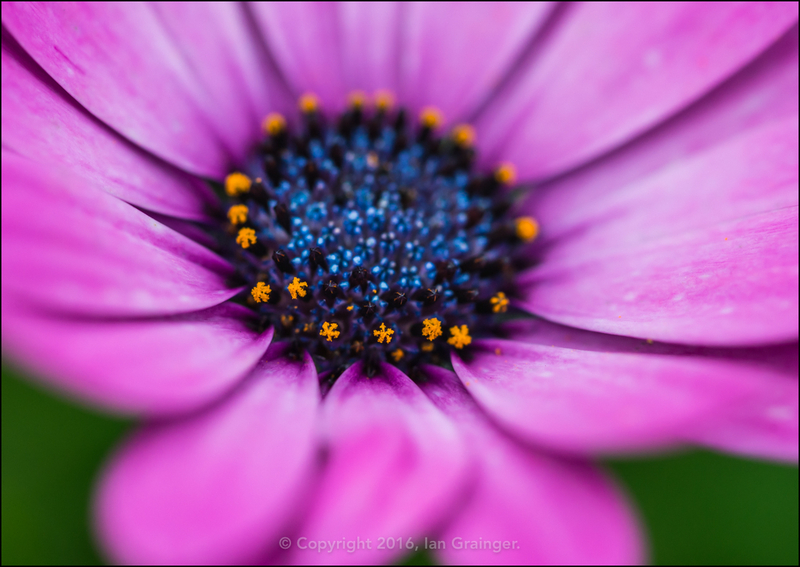 The African Daisies (Osteospermum) had disappeared once, but were back again. 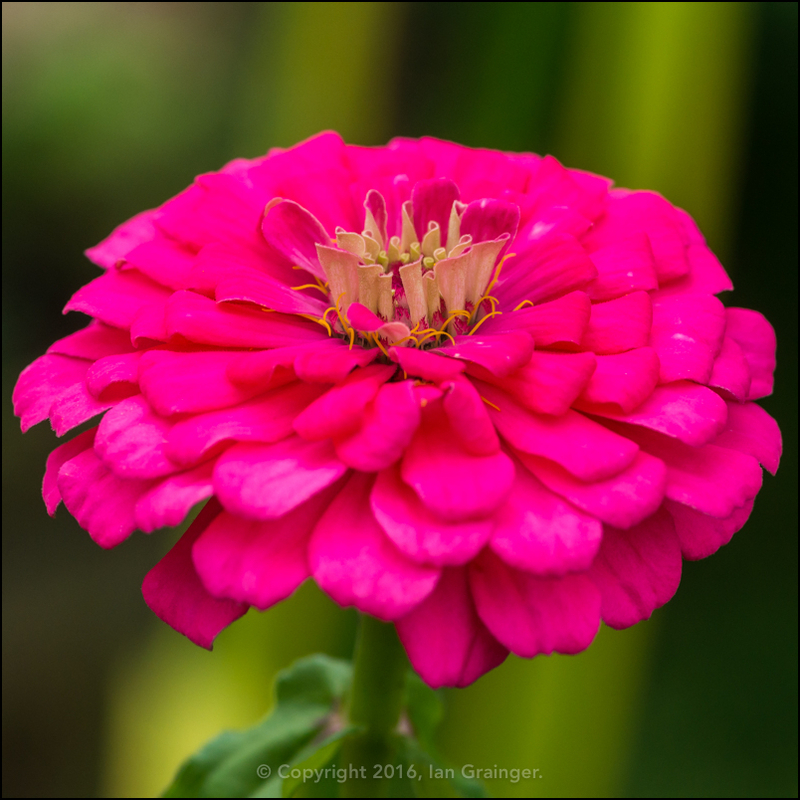 The Zinnia were still going strong, as they had been all summer long. 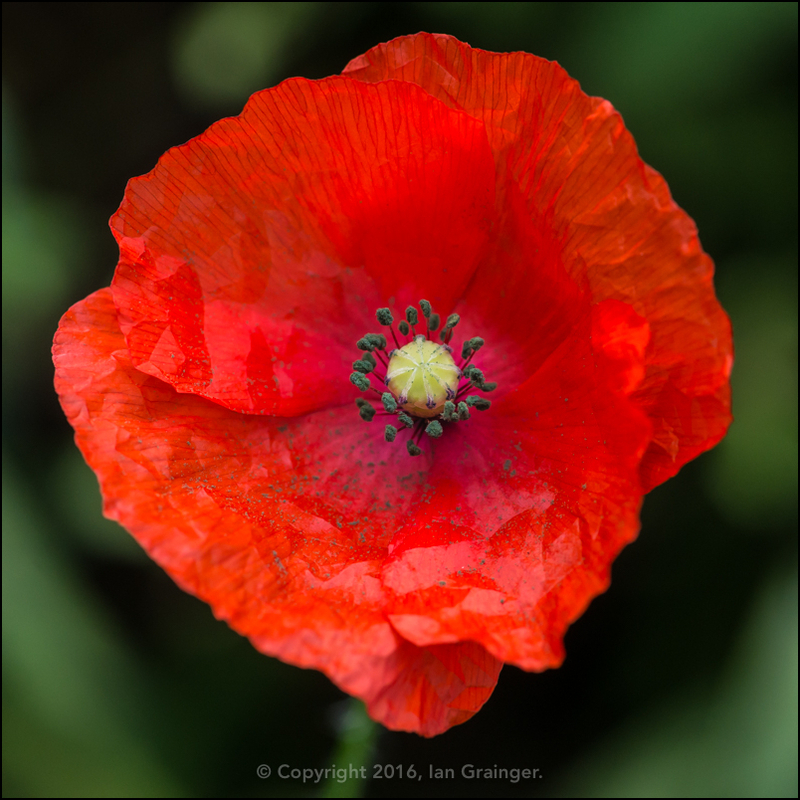 I even had Corn Poppies (Papaver rhoeas) still popping up from a packet of free Grow Wild Scheme wild flower seeds I talked about a few weeks ago. 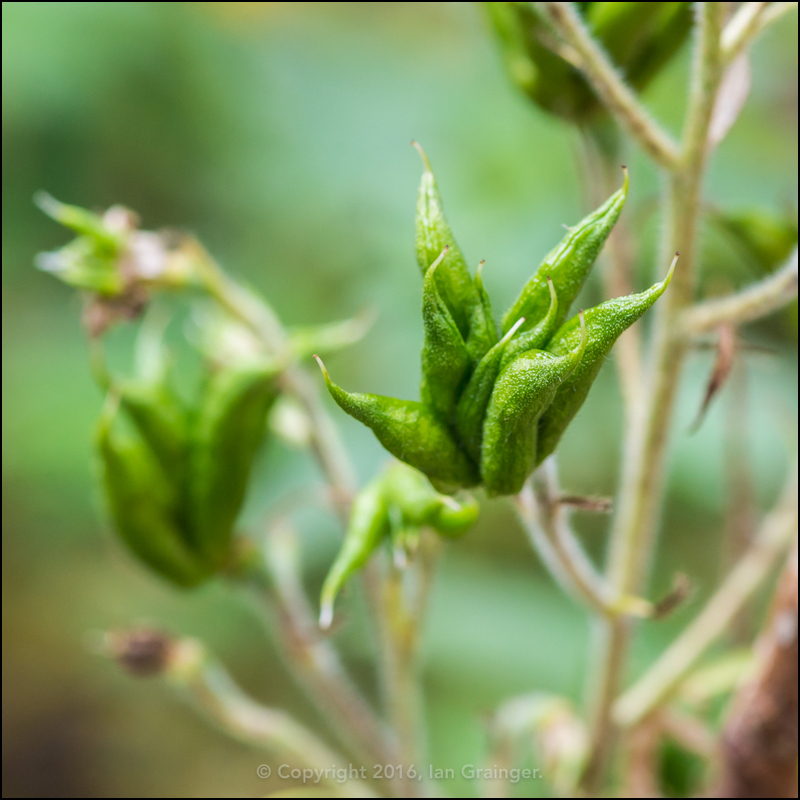 My late flowering Delphiniums are still flowering, and I even have new buds to open on a couple of plants. 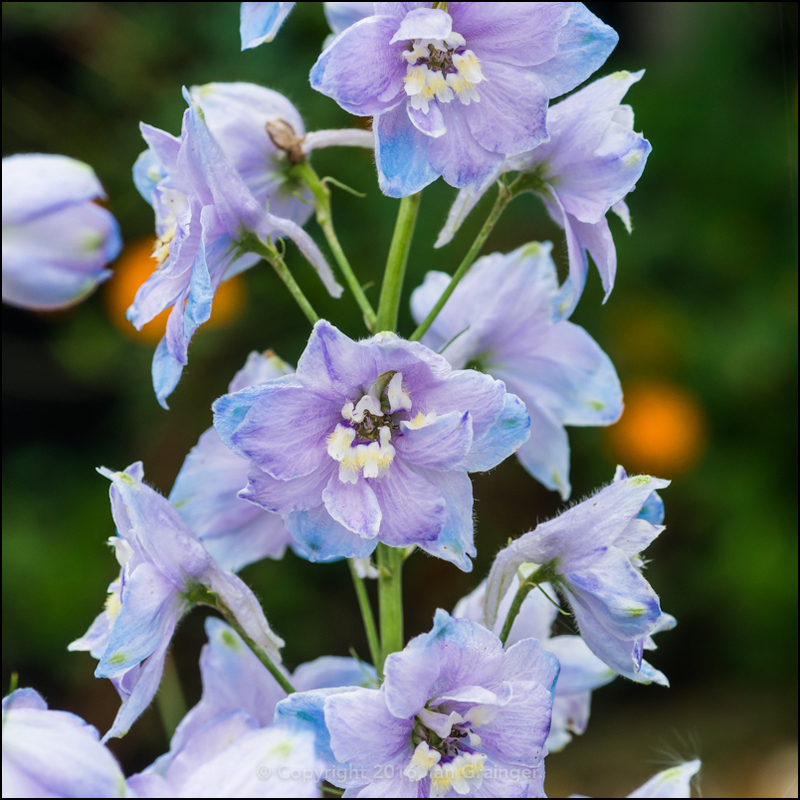 Other Delphinium plants have finished, however, and are setting seed. As have the majority of my Lupins (Lupinus). Finally, this week, my feline photo friend seemed a bit restless. 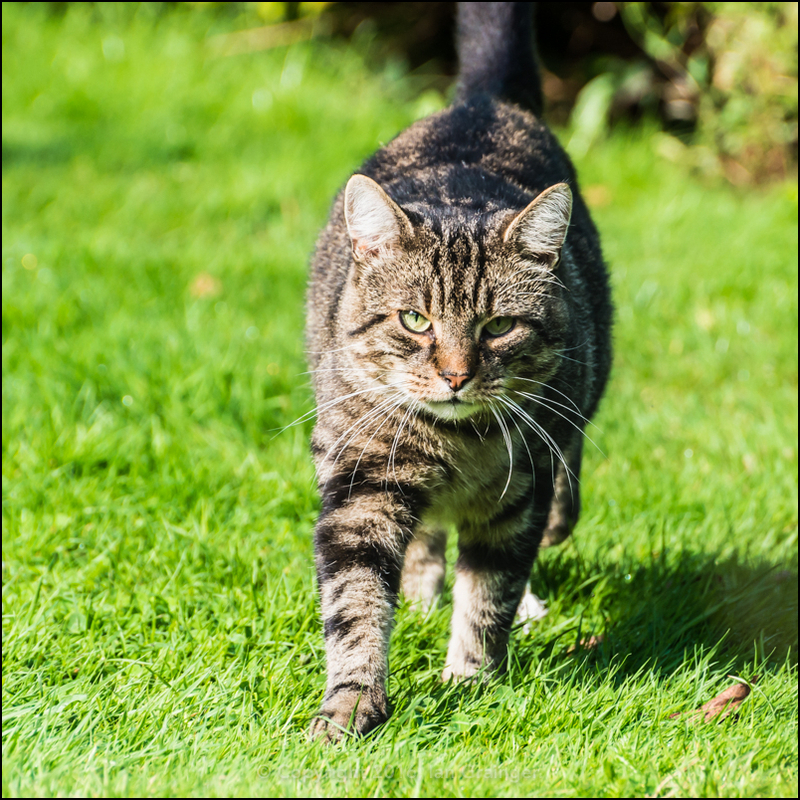 He followed me around, calling as usual, but was annoyed that I didn't stop often enough, to make a fuss of him!